Close your eyes and imagine you have before you not a flagon of wine as Beatrice Warde would have requested—but a chair. Now, imagine this chair is handsome and dignified in its form. The wood has been laboriously shaped, sanded, and finished so it’s smooth as glass. The leather seat is soft and supple. Every joint, edge, seam, and stitch has been taken into consideration. The chair is clearly a labor of love and a work of art. It’s one of the most stunningly beautiful chairs you’ve ever seen. However, when it comes time to rest your weary feet and sit in this chair, you hesitate for fear of leaving a mark or bruising it in any way. This chair is beautiful, and you know it will be sinfully comfortable, but it is not well-designed for the simple task of sitting down. The primary, most basic function of a chair is to enable the act of sitting. When one is able to sit down safely and comfortably in a chair, that chair is considered to be well-designed for its purpose. If the chair is sturdy and well-made, then that’s all the better. If the chair is handsome, then that, too, is a plus. However, if we continue down this path, incrementally increasing the quality of the materials and craftsmanship with the notion that we can elevate the experience, there is a point at which these embellishments can become a distraction from and an obstacle to the simple act of sitting. The furniture maker can give us too much information which has little to do with the task at hand. Let’s imagine another chair. (Closing your eyes is optional.) This new chair is modestly constructed, handsome, and not the least bit intimidating. Upon first glance, it seems as though it’s a chair worth sitting in. So you do. Handsome and unimposing as it may be, it turns out it’s the most uncomfortable chair you’ve ever sat in. Your shoulders ache and your backside goes numb. Again, the chair is handsome, but ultimately it is not a successful piece of design. We’ve now sat in an imaginary chair that is emotionally uncomfortable and an imaginary chair that is physically uncomfortable. There are similar parallels in bookmaking that should be of concern to fine press designers, binders, and publishers. The primary, most basic function of a book is to convey the coherent and specific ideas of a writer. A book does not need to be handsome, and it does not need to be well-made. To carry out its most basic function, a book need only be a gathering of legibly printed pages. In these first days of the twenty-first century, this is best exemplified by the paperback book. It’s compact. It’s legible. It does its job and not one thing more. Just as, say, a folding bridge chair is well-designed for its purpose of enabling the act of sitting, a paperback book is well-designed to convey the specific ideas of its author. Louise Genest’s one-of-a-kind binding of Match in a Bottle. Photo courtesy of Joshua Heller Rare Books, Inc. In his film Design Q & A, the architect and designer Charles Eames defined design as “a plan for arranging elements in such a way as to best accomplish a particular purpose.” When a designer inquires as to how to achieve a particular purpose, he must consider the user, and predict how the user will interact with that which is being designed. The typographer or binder must ask how a reader interacts with a book and what a reader expects from a book. In other words, what must the book do? When the work of the book designer or binder strays too far from an innately recognizable and useful book or otherwise does not meet the expectations of the reader, and the reader is afraid to interact with that book or finds the reading of it to be physically uncomfortable, the design is not successful. That which is innately recognizable as a book is in constant transition as changing technology and methods of production affect the tools we use every day. 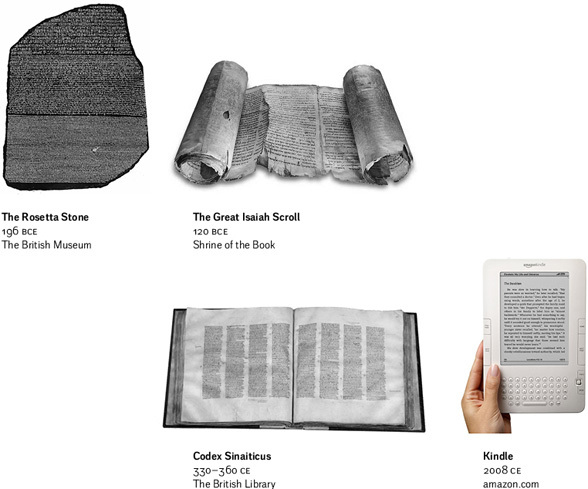 Consider the evolution from the stone tablet to the scroll, or the codex to the Kindle. They all have the same basic purpose, but they fulfill that purpose in different ways in order to best meet the expectations of the users of their time period. One could argue that the fine press book follows a time-tested model, but that model—say, the Kelmscott Chaucer—would hardly pass as an acceptable piece of design in our modern world. It may be a stunningly beautiful book, but it is no longer an effective tool for conveying specific ideas because it was not made with the types, tools, and techniques with which readers are now familiar or comfortable. An abbreviated history of the book. Fine printers and binders generally do an exceptional job of paying attention to every detail in the production of a book. However, more often than not we pay too much attention to the little details and end up missing the big picture: that a book is ultimately a tool no different from a chair or a phone or a car. Tools are meant to be used and serve a specific purpose. Chairs are meant to be sat in. Phones facilitate verbal communication over distance. Cars get us from one point to another. Books store and convey ideas. The designs of these tools have evolved as our technologies and tastes have evolved. When fine press designers and binders plan books that use letterpress printing, handmade papers, and intricate hand-bindings, it is as if they are designing cellular phones with rotary dials. For a very long time the rotary worked just fine, but once the keypad was introduced, most users found the rotary cumbersome and slow. At this point there is probably a significant portion of the population that might not even know how to use a rotary phone—just as a significant portion of the population doesn’t know what a deckle is or why such a thing would be on a book. In planning the iPhone, the design team at Apple predicted how the phone would be used and how the user would interact with it. They got rid of buttons in favor of a touch-screen. They didn’t put a rotary device on there. They used the tools of our time to best accomplish a particular purpose and made a beautiful thing at the same time. The designers of the iPhone asked first what the phone should do, and then how the phone should look. 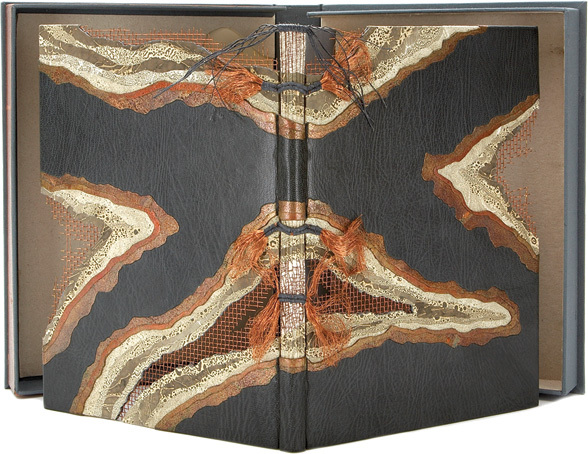 The deluxe limited edition, with its glowing letterpress impression, dancing deckled edges, and sumptuous handcrafted binding of leather and imported cloth is, no doubt, an example of a truly beautiful book. It appeals to our fingers, eyes, ears, and nose, and turning its pages can be a glorious assault on our senses. Because of this, most fine press books transcend the mere Book to become Art. While these may be works of art, they cease to be useful and functioning books capable of conveying specific and coherent ideas. Because we are so accustomed to mass market and trade productions which use the tools and materials of our time in history, the physical elements and processes traditionally chosen for fine press books are unfamiliar to the modern reader and thus call too much attention to themselves. It is impossible to handle them without reveling in the deliciousness of the materials—though all the while feeling panic over the possibility of damaging these precious items. Because fine press editions are so luxurious and often unwieldy, it is impractical and terrifying to read these books. People are often afraid to even touch them. When someone is intuitively afraid to touch a book—let alone read it—that book—like the imaginary chair we were afraid to sit in—is not well-designed. 1. Consider the needs and concerns of the reader, and incorporate contemporary materials and processes with which readers of our time in history are comfortable and familiar. 2. Make books that are human-scale and can be handled and read easily and comfortably. Miniature books are impractical. Large folios are unwieldy. 3. If one insists on ignoring the first two suggestions, fine press publishers should reduce the amount of content in their books. When the physical materials are overwhelming, the reader will only have attention for a single poem or short piece of prose. A shorter text will allow for the reader to take in the form and the content. Of course, this risks evoking the feeling of a peal of trumpets announcing a game of gin rummy. In order to avoid that, see the suggestions above. Making books whose sole purpose is to exist as exemplars of the craft is, of course, a worthwhile and noble pursuit. However, one must not confuse good craft & beauty with good design & communication. When that occurs (as it so often does in contemporary fine printing), the parts of the book are inevitably greater than the whole. Although I can go on about the above for hours, this little essay sums up fairly well my reasons for retiring from traditional fine printing. From here on out I hope to pursue a new form of fine printing—which I think is actually more in keeping with what the old guys had in mind. Fine printing was never meant to be about metal type and handmade papers. Those were just the tools the Founding Fathers of Fine Printing had around. They were simply using the tools of their time to make the best books they could—and by doing so, they served as a model for industry. Imagine what our typefaces and book designs would look like if Gill, BR, and Mardersteig hadn’t been working with tools that were almost identical to those of commercial book design and production. We owe so many of the classic and useful English Monotype faces to the influence of fine printing on the commercial book trade—and that influence would not have taken place if the industrial designers had not been able to see that the work of the craft designers was related and relevant. Contemporary fine printing no longer has any influence on the contemporary book trade. Unfortunately the ties have been severed between the two because contemporary fine printers do not make books that have anything to do with the modern world. Now, how do I know contemporary book designers are not influenced by contemporary fine printers? Contemporary fine printers are almost never featured in magazines, journals, or blogs about graphic design and typography. Further proof? Ask any contemporary book designer (other than Jerry Kelly) to name his or her favorite contemporary fine printer. I bet you won’t get much of an answer. An even more tragic test is to ask a contemporary fine printer who their favorite contemporary book designer is (other than Jerry Kelly). My guess is they won’t have much of an answer either. Fine printing and book design are now like two ships passing in the night. Of course, most fine printers are justifiably unconcerned with influencing the trade. My point is only that if what fine printers were making was well-designed and useful, book designers and the design community would be paying attention. Keep in mind, too, that design is not just about how something looks, but about how it works. It’s possible for something to look good yet work poorly—and if something doesn’t work, who cares how good it looks? Now, this new form of fine printing that I mentioned earlier and hope to pursue? The plan’s really not much different from what the old guys laid out in the late nineteenth and early twentieth centuries. I’ll just be using the tools of my time in history to make the most useful and the most readable books I can. If Morris, Gill, BR, Mardersteig, and all the old heroes of fine printing were around today, they’d be doing the same thing. This essay has appeared in several places, most recently in A Kat Ran Checklist.